Following a break of about two weeks Morrissey resumed his Greatest Hits tour with a bunch of dates on the American East Coast. The tour wasn't officially announced as a Greatest Hits tour in the media, but that's how it was named on the merchandise. Although the fans were not aware of it at the time, Morrissey was indeed planning the release of a new Greatest Hits package. However it would take another eight months for the album to finally come out. 'Greatest Hits' seems to have been taken here in a much broader sense as Morrissey revisited other aspect of his career besides the obvious musical ones. One of the Greatest Hits t-shirts featured a pair of boxing gloves, a likely reference to his 1995 single "Boxers". The bass drum had the words ART SUFFER ENGLAND HATRED on it, in white letters over blue skin. That phrase had already been used by Morrissey in 1991 in advertisements for his "Kill Uncle" album. Morrissey also took the stage at the end of Big Hard Excellent Fish's "Imperfect List" or Jobriath's "What A Pretty" or an unknown instrumental piano piece, all intros that had been used on past tours. This second leg started off on a bad note. Seven songs into the first show Morrissey walked off stage not to return. He had to cancel the following three dates because of a throat infection. Following this he returned for one show in Virginia, but then had to cancel three more. Of the six and a half cancellations, only Boston, Philadelphia and Atlantic City were rescheduled, the former on 7 July and the latter two at the tail end of the planned itinerary. Personnel: Boz Boorer - guitar, clarinet; Jesse Tobias - guitar and occasional cymbals; Solomon Walker - bass; Michael Farrell - keyboards, occasional guitar, accordeon, trombone, trumpet; Matt Walker - drums. Morrissey played tambourine on "The Queen Is Dead". 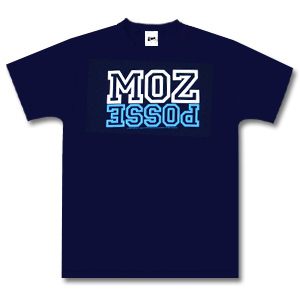 -Blue "Moz Posse" t-shirt, 35$, view. 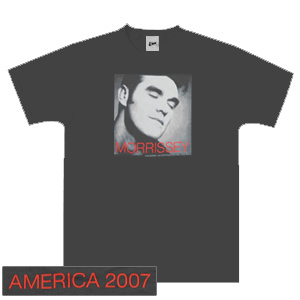 -White t-shirt with Greatest Hits artwork image on front and "America 2007", 35$, view. 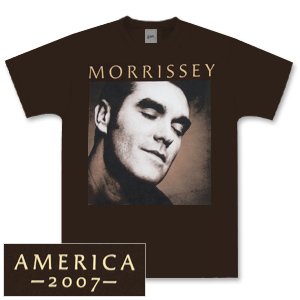 -Brown t-shirt with Greatest Hits artwork image on front and "America 2007" on back, 35$, view. -Charcoal coloured t-shirt with Greatest Hits artwork image on front and "America 2007" in back, 35$, view. 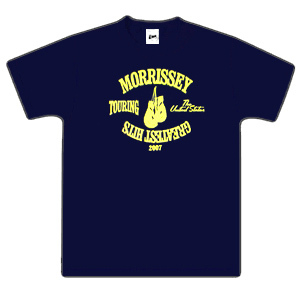 -Blue "Greatest Hits / Touring The United States" boxing gloves t-shirt, 35$, view. 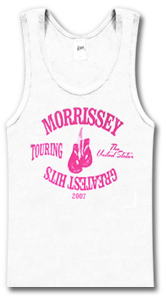 -White "Greatest Hits / Touring The United States" boxing gloves tank-top, 35$, view. 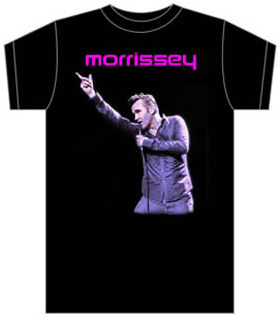 -Black t-shirt with live photo of Morrissey pointing up, Morrissey's name in pink Jobriath-style font, originally sold on the 2004 tour. This might not have been for sale on every date. view. This was probably similar to what was reported for the first leg of the tour. -Sacha Distel - "Où ça où ça"
-Anthony Newley - "I'm The Boy You Should Yes To"
-Lypsinka - "The Twelve Daze Of Christmas"
-Vince Taylor - "(There's A Whole Lotta) Twistin' Going On"
After the latter footage the curtain/screen dropped and Morrissey's walk-on music started. On most dates Morrissey walked on stage at the end of Big Hard Excellent Fish's "The Imperfect List". 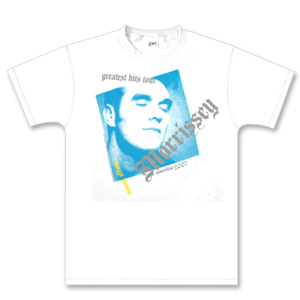 On the first Boston date the walk-on music was Jobriath's "What A Pretty" and for the second Boston show Morrissey entered stage following an unidentified piano piece. After the show the fans exited the venue to Frank Sinatra's "That's Life". 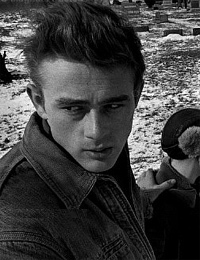 James Dean looking over his shoulder. The image was displayed three times, like a triptych. Photo by Dennis Stock. The uncropped original showed his brother Cal Dean's gravesite next to him. View original or in situ. Setlist-wise the highlight of this leg of the tour was the live introduction of new composition "I'm Throwing My Arms Around Paris". The song was debuted in Jacksonville and played again twice, in Philadelphia and Atlantic City at the very end of the leg. 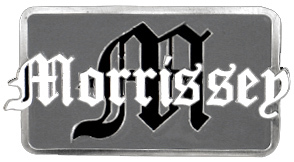 The song would not be released until early 2009 as the debut single off Morrissey's "Years Of Refusal" album. The two earlier live additions "All You Need Is Me" and "That's How People Grow Up" were played regularly on this leg. Both were also unreleased in studio form at the time, they would be included on Morrissey's Greatest Hits compilation in 2008, and be released as singles from it. Despite this being the first real tour of the USA since the release of his latest album "Ringleader Of The Tormentors" Morrissey did fewer songs from it here than in Europe the previous year. The album's singles "You Have Killed Me", "In The Future When All's Well" and "I Just Want To See The Boy Happy" were done every night or almost, while "The Youngest Was The Most Loved" was played twice for variety. Album tracks "I Will See You In Far Off Places", "Life Is A Pigsty" and "At Last I Am Born" were played often but not always. Previous album "You Are The Quarry" was represented by its first three singles, "Irish Blood, English Heart", "First Of The Gang To Die" and "Let Me Kiss You", each played every night or almost. The era's b-side "Ganglord" was played on the first two dates of this leg, then dropped. 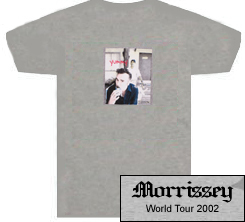 A common complaint on the recent Tour Of The Tormentors MMVI was the near-absence of material from Morrissey's solo back catalogue. The man made up for that on this tour by playing "Disappointed", the near standard encore "The Last Of The Famous International Playboys", "Everyday Is Like Sunday" and "The National Front Disco" on most, if not all dates. "Whatever Happens, I Love You" was done here and there for variety. "You're Gonna Need Someone On Your Side" and "I've Changed My Plea To Guilty", which had been regulars on the previous leg, were now played only a few times each. "Lucky Lisp" and "Suedehead", which had been part-timers on the previous leg, were now completely dropped. The Smiths years were represented by a record total of 7 different songs. It must be said however that the setlists never featured all of them on the same night. "The Boy With The Thorn In His Side", "Girlfriend In A Coma", "How Soon Is Now?" and "Please, Please, Please, Let Me Get What I Want" were staples. "The Queen Is Dead" and "Panic" took turns in the opening slot. The classic "There Is A Light That Never Goes Out" was played once only, in Jacksonville. Here is the number of times each song was performed on this leg, in descending order of frequency. This is based on 14 concerts. In "Disappointed" Morrissey generally stuck with the song's original first line "Your unsleepable friend". However he always made the usual changes to "your friends and your foes would rather die than have to sleep with you", "I have spent my whole life confused because of people who were nice" and "Young girl one day you really will be old". As always the audience supplied the shouts of "No!" at the end of the song. Following this, instead of singing "no I've changed my mind again", Morrissey simply went "Yes! Yes! Yes! Yes! Yes! Yes! Yes!". In "Everyday Is Like Sunday" Morrissey always replaced "etch on a postcard" by "scratch on a postcard" and this was usually (but not always) followed with "Oh Mama! how I dearly wish I was not here". The change to "I do believe this is the coastal town" returned on a few dates and "please come please come nuclear bomb" was done most of the time. The line "trudging back over pebbles and sand" was sometimes followed with mumbled words, or something that sounded like "bum, ba-dum, ba-dum". On a few occasions Morrissey extended a line to "come Armageddon come, soon, please!". The song's final line was usually extended to "everyday is silent and grey at least when you're all alone, when you're on your own, when you're all alone" or a variation thereof. It must be said here that Morrissey was more reserved with the changes in this song towards the end of this leg. At the end of "Life Is A Pigsty" Morrissey still replaced "I only live for you" with "I have lived only for you", "I'm falling in love again" with "I am in love again" and "but I'm still the same underneath" with "how come I'm still the same underneath". Everytime the song was played it still segued at the end into the traditional air "Auld Lang Syne" (which echoed the ending of the Smiths' "Asleep") then this in turn lead straight into "How Soon Is Now?". In the latter Smiths classic the "shyness that is criminally vulgar" was changed to "...criminal and vulgar" (often) or "...crippling and vulgar" (sometimes). Morrissey usually changed "you could meet somebody who really loves you" to "you could meet somebody who even likes you". On very few occasions he made the recently added change "how can you say, I live my life the wrong way". Here and there he extended the line "and you cry and you want to die" with something like "what else?" He also often extended a line to "look at this face! all my hope is gone". As always the song's final verse was never done. During the "and you see someone you physically despise" part in "Let Me Kiss You" Morrissey still teasingly tore his shirt open and threw it into the audience. That song's live change to "you'll try anyone twice" was done almost every night. A new change was introduced on this leg: Morrissey started the song by singing "There's a place in the sun for anyone who has the nerve to chase one". In "I Just Want To See The Boy Happy" Morrissey occasionally did minor changes like "thank God soon I will be dead" and "for my own life I never cared anything". "The National Front Disco" did not end in a noisy chaotic jam the way it did in 1992 or 1995, instead it ended with the same two notes repeated extensively in a staccato manner. A nice addition to the song was the piano line played by keyboardist Michael Farrell. Morrissey usually replaced "she should know why you've gone" with "she should know where you've gone" and always skipped the "settle the score", "then you might do" and "...Front disco" bits. He still replaced the second occurrence of "we've lost our boy" with "have we lost our boy". The 2007 live arrangement of "The Queen Is Dead" started with the line "Farewell to these marches, stuck like a boar between arches". The "I'm truly sorry" part of "I'm truly sorry - but it sounds like a wonderful thing" was dropped. Morrissey usually asked Charles if he ever craved "...to appear on the front of the Daily mail dressed in your brother's bridal veil?". The line "I never even knew what drugs were" was changed to "I still don't know what drugs are". The change most people noticed was the one to "she said 'I know you, and you cannot sing', I said: 'Of course I can you silly thing!'". As always the last two of the three verses starting with "We can go for a walk..." were dropped and Morrissey sang "you can trust me boys" instead of the second occurrence of "it's so lonely on a limb". Throughout the previous year Morrissey had often improvised one-off changes in "You Have Killed Me" but here he seemed to settle on regular ones. He usually started the song with "Pasolini is me, Rossellini I would rather be" or "Pasolini is me, Fellini I would rather be". Further down he sang "Anne Sexton you will always be". Previous live changes "what the hell is my life for" and "who am I that I come to be standing here" were still done regularly. However Morrissey apparently stopped doing "I entered nothing and obviously nothing entered me" and "I entered nothing and look! nothing entered me". In "First Of The Gang To Die" he often changed a line to "the first lost lad to go - where else? - under the sod" and this was sometimes followed with an exclamation like "goodbye! ", "ciao!" or "so long!". In "The Youngest Was The Most Loved" the man often sang "We kept him from the world's glare thank God! he turned into a killer" and "We kept him from the world's glare so what! he turned into a killer". Morrissey still switched to the first person for the first verse in "You're Gonna Need Someone On Your Side" ("with the world's fate resting on my shoulders, I'm gonna need someone on my side, etc"). He also usually sang "someone kindly told me that you've thrown away every day of your teenage life". Instead of the early lyric "I was a small fat child in a council house" in new composition "All You Need Is Me" he sang "...welfare house" which was what he ended up recording for posterity. He also often sang "yet you remain here 'cause all you need is me" and "all you can do is stand there and complain about me". In "That's How People Grow Up" he sometimes made the very minor change from "someone who does not exist" to "someone who doesn't really exist". In "I Will See You In Far Off Places" Morrissey rarely changed "I will close my eyes forever" to "I will close my mouth forever" anymore, but he still sang "It's so easy for us to stand here together but it's impossible for the flesh to combine" most of the time. The most noticed change in that song was obviously the one from "if the USA doesn't bomb you" to "if George W Bush doesn't kill you". In a similar vein, the previously heard change in "Irish Blood, English Heart" to "I've been dreaming of a time when Americans are sick to death of Republicans and Democrats" was now updated to "I've been dreaming of a time when Americans are sick to death of Republicans". Morrissey now remained silent instead of singing "...and Democrats". A previously heard rare change to "you can see me standing by the flag not feeling shameful..." was now done more commonly. 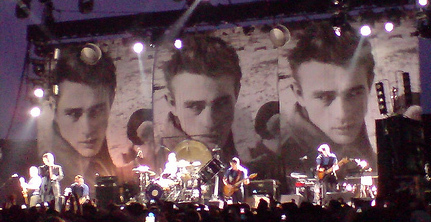 Morrissey still replaced "it's safer to be inside" in most live performances of "I've Changed My Plea To Guilty" with "it's safer to stay inside". He was less playful than he had once been in "In The Future When All's Well" and often reverted to the song's original lyrics. The only change done regularly was the one to "something must have gone wrong". He sometimes changed a line to "everyday I play a very sad game called..." or a variation on that, and another one to "I thank you, I do!". In "Whatever Happens, I Love You" he changed "we stole each other's clothes" to "we wore each other's clothes" as had done before in 1995. In "At Last I Am Born" Morrissey often changed "vulgarians know" to "vegetarians know". He alternated between the basic "difficult child" and the alternate "fat little child". He often added emphasis to a line by singing "at last I am born, yes!, it took me a long long time..." In "The Last Of The Famous International Playboys" he sang "Reggie Kray always knew my name" and "Ronnie Kray always knew my name". He sometimes reversed the order of those two lines. As he often did in the early nineties he sang "just to make myself more attracted to you" and let the audience supply the higher-pitched 'international' in the title line. One new change introduced on this leg was the one to "in our lifetime those who kill, Fox News hands them stardom". At the end of "Panic" Morrissey sometimes followed the final "hang the DJ!" with exclamations such as "any DJ!" or "take the hint!". The title line in "Please, Please, Please, Let Me Get What I Want" was always changed to "Please, please, please let me have who I want". As in the Smiths days that number's second half (final two verses) was repeated to extend the song's length. However in the repeated part Morrissey changed the melody of the line "let me have who I want" by bunching the words closer together. The song's mandolin ending was recreated beautifully with guitar, keyboards and trumpet. The Smiths classic "There Is A Light That Never Goes Out" was lyrically very faithful to its studio counterpart. At this point in time Morrissey sang the chorus at the end of the song. He had only done this once at the very beginning of the Queen Is Dead tour in 1986, then never again, even in solo, until halfway into the festival dates of 2004 when he started singing the chorus. Nothing from these live dates has been made available on official releases at this point in time. None of the live dates from this leg are available on full length video bootlegs at this point in time. The only thing offered to fans and collectors (besides the usual short-lived Youtube material) are four digital video files circulated on the internet, one for each of the following concerts: Orlando, Jacksonville, Philadelphia and Atlantic City. Each file features about 30 to 40 minutes of so-so video footage with bad sound. Most of the shows from this segment of the tour have been recorded by at least one person. However very little of it is being shared right now, the recordings are still being kept as trading currency. The only well circulated bootleg of a complete concert out there at this point in time is the one for Atlanta. The sound quality is average, but that show was one of the least interesting of this leg of the Greatest Hits tour. Three songs from Birmingham are also found in digital format on the internet, in rather bad sound quality.